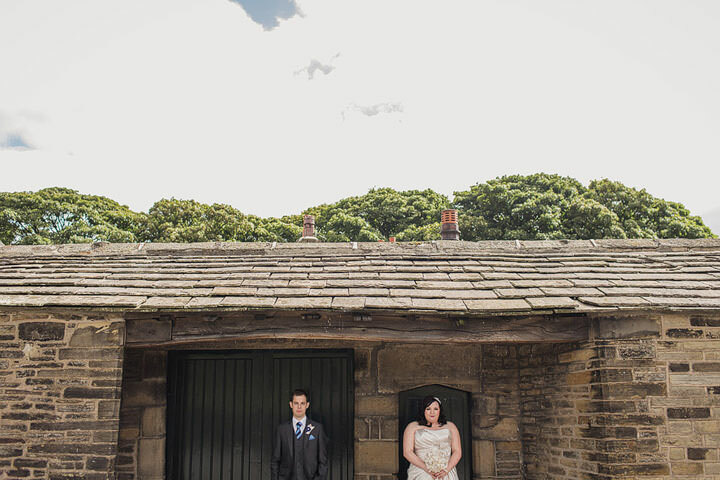 You may remember Becki and Jonny today’s bride and groom, as Becki was one of last years Boho Brides. 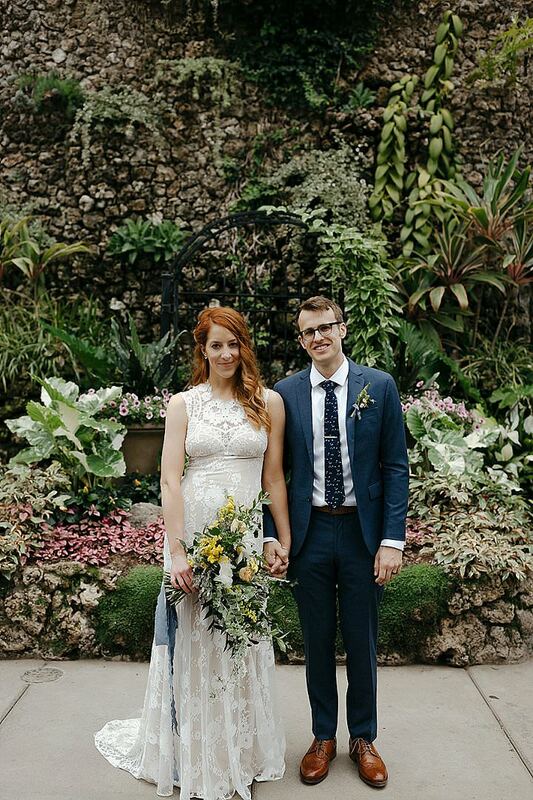 She wrote for the blog and shared with us her wedding planning journey as well as a whole host of DIY projects. 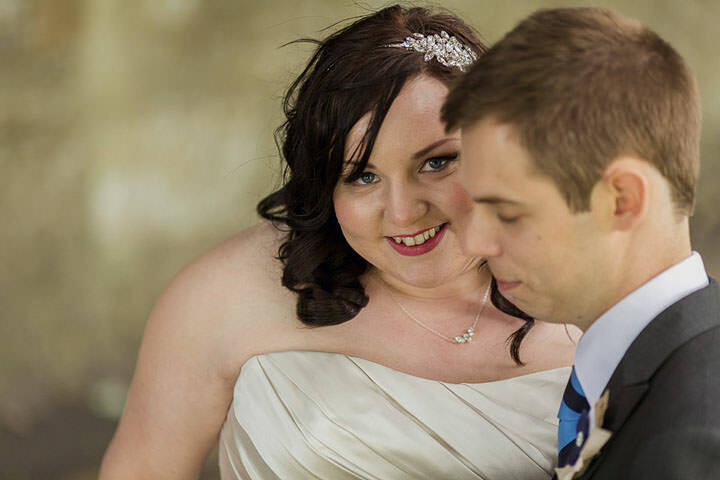 Well today I am delighted to be able to share with you Becki and Jonny’s wedding! 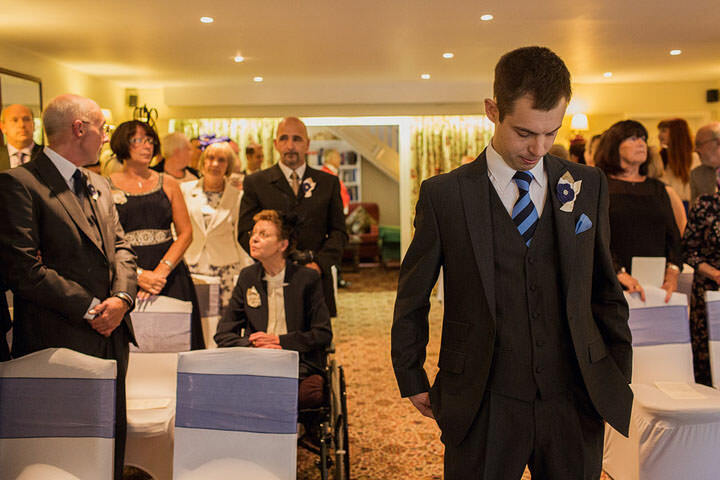 This wedding is even more special as I was actually fortunate enough to be a guest at the wedding! (I have taken out all the photos of me in case you were wondering!) 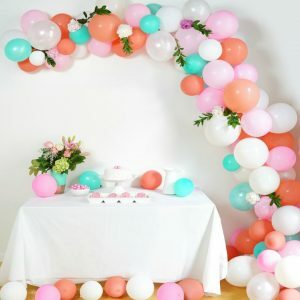 It was a wonderful day, which was absolutely jam-packed with DIY projects, handmade details and so many personal touches! 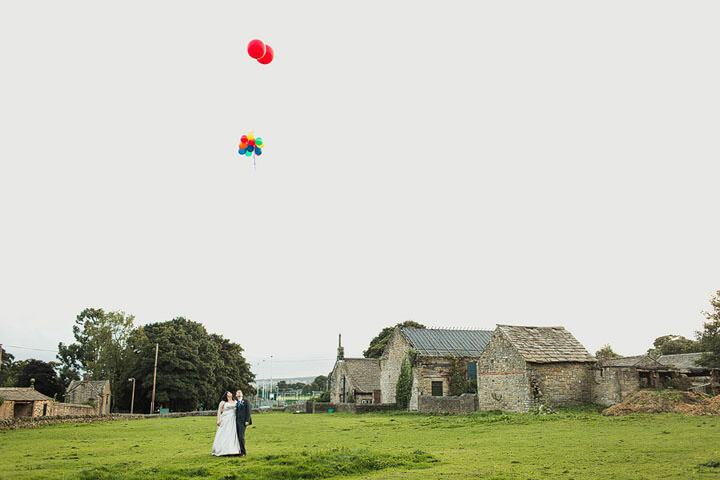 Paul and Kelly from Paul Jospeh Photograhy did a wonderful job of capturing every moment of the day, from the amazing first look to the balloon release to all the wonderful details. A fabulous day I’m sure you will agree! 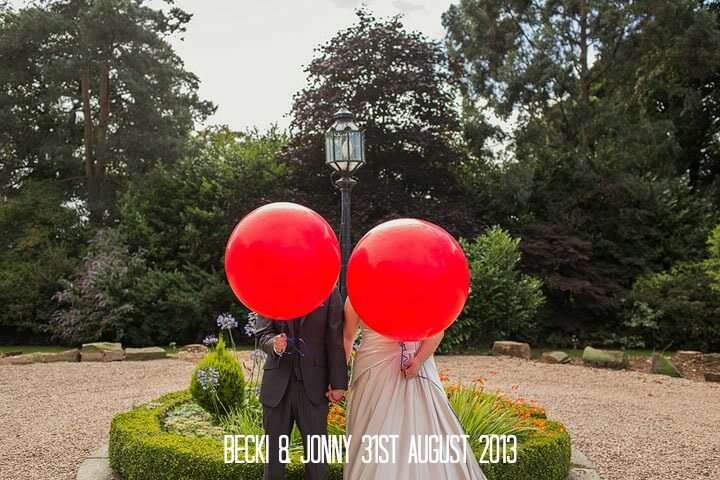 Big love to Becki and Jonny, I hope you are enjoying married life together. We met at school when I was 15 and Jonny was 17, so we’ve been together 12 years already! I actually wrote a poem which was displayed at our wedding before the ceremony for when our guests arrived. Exactly one week after my best friend’s wedding, Jonny and I were on holiday in Fuerteventura and he popped the question in a restaurant overlooking Jandia beach. Without hesitation I said yes! Totally overcome with emotion of finally being asked, it was only afterwards did I then wonder where the ring was? So J presented me with a coke can ring pull and said this is just a memento to keep until we choose your actual engagement ring! The main bulk of the budget was the venue, the honeymoon and our photographer. 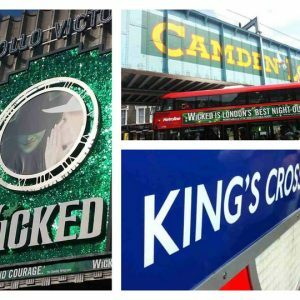 We decided pretty early on that these were our main priorities so they were booked and paid for pretty much straight away. 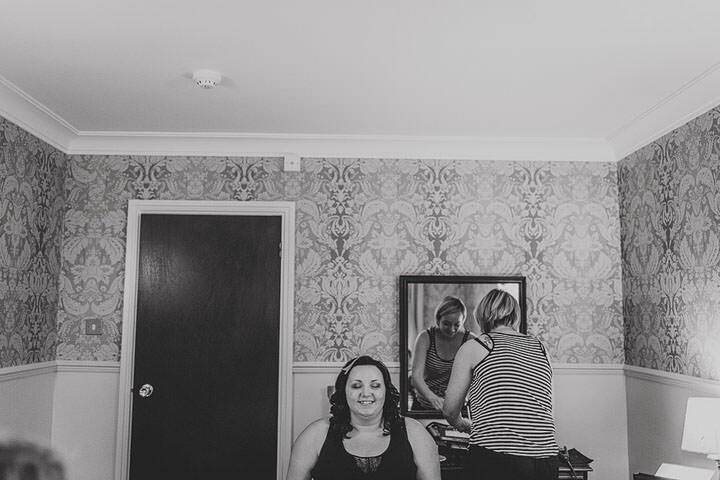 Then of course my next priority was the dress which my mum had kindly offered to pay for, so we knew the budget on that before we even stepped through the door of any bridal shop which I honestly recommend to all brides out there! People refer to the “one” quite a lot when you are talking about getting married. 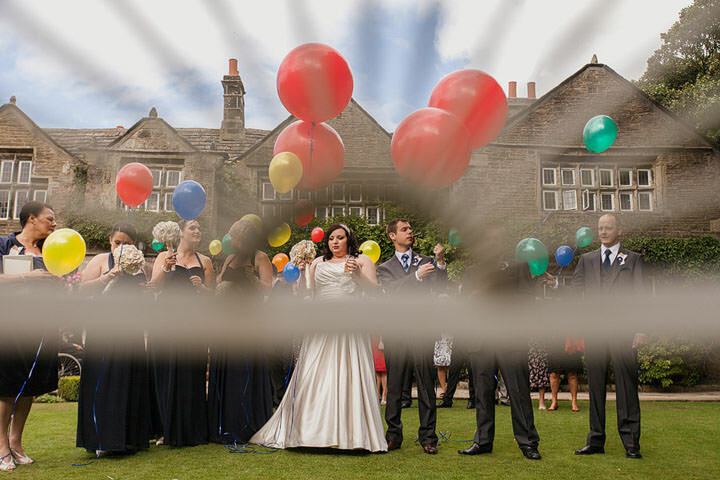 The “one” in terms of the one you love, the “one” in terms of the perfect wedding dress, well that term should totally apply to your photographer too! 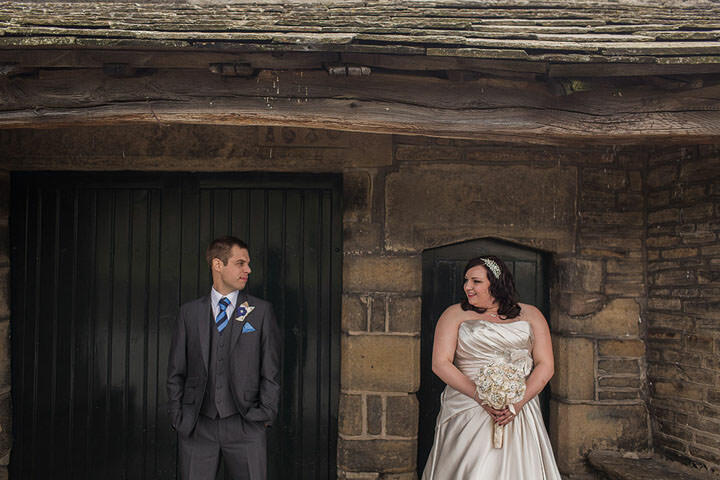 And we totally found the one, the awesome duo of Paul & Kelly that is Paul Joseph Photography. 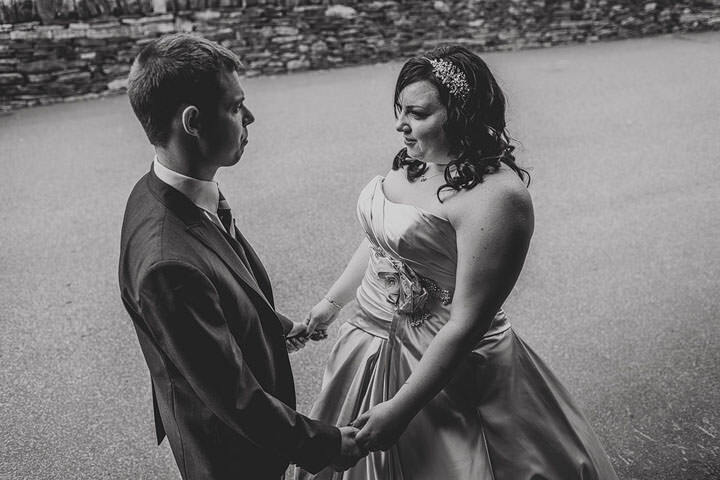 My dress was by Benjamin Roberts style 2130 in Champagne and was purchased at a local bridal shop called Brides to Be just up the road from where I live. 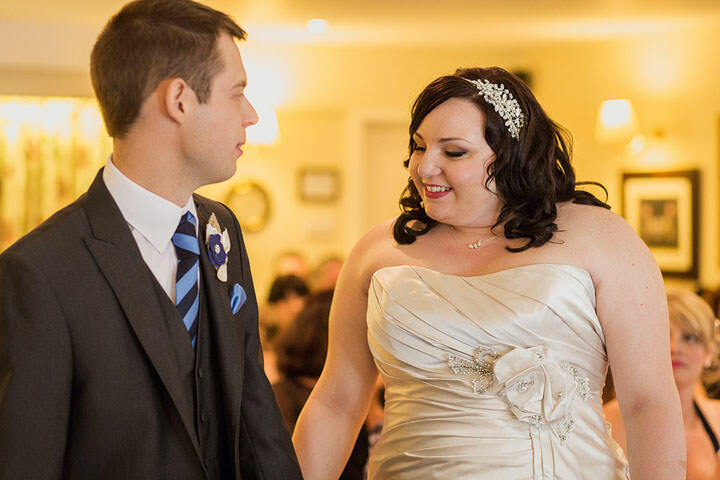 I had decided fairly early on that traditional white and ivory dresses were not for me and the champagne coloured dress just shimmered so much that as soon as I saw it on the hanger I knew I loved it. My swarovski crystal headband was called Ameli and matched the Vanessa necklace I wore, both were handmade jewellery designer Chez Bec. The bracelet and earrings were bought from Ayedo and were marquis shaped diamantes to match the Chez Bec jewellery. The shoes I wore during the day were by Karen Millen and I changed into some navy blue glitter heels by Dune for the evening. 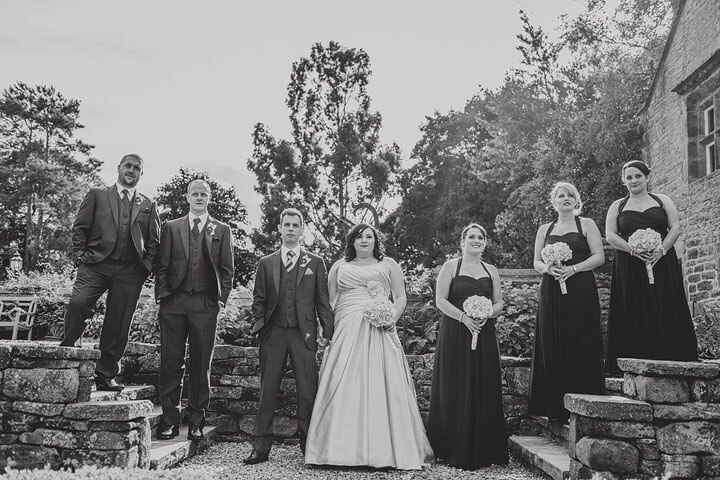 The suits were hired from Brides To Be and were 3 piece suits in charcoal grey by Peter Posh with Navy Blue ties for the gents and J bought his own tie and pocket square to keep.The bridesmaids looked absolutely stunning in floor length navy blue dresses by Coast teamed with satin heels from Dorothy Perkins. The decoration for our day I would say was light and romantic. We had lots of tealights, hundreds of tealights in fact! Each of the birdcages held 6 tealights and we had 5 of my hand decorated jam jar tea light holders on each table too so they really did light up the room and sparkle into the evening. 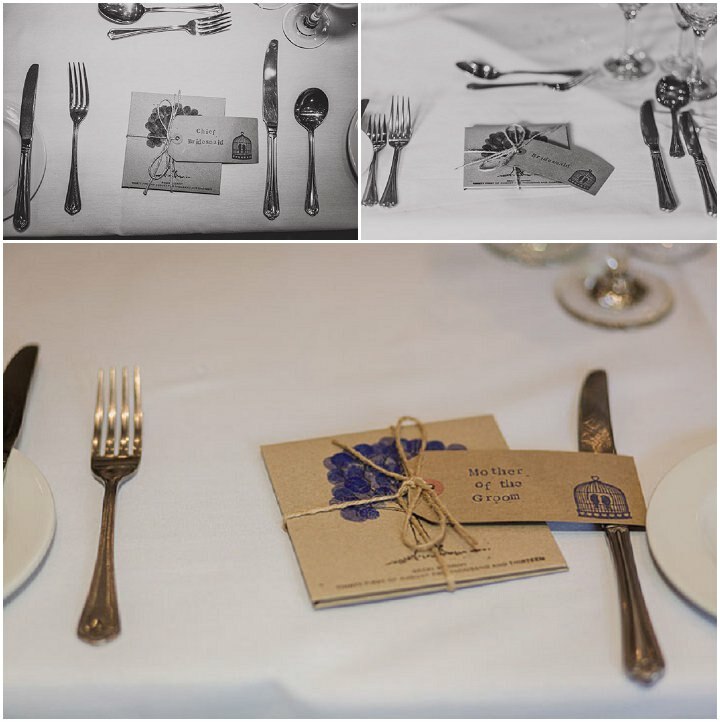 The crisp white table cloths and chair covers with blue organza bows, the tealights everywhere and the hints of burlap and brown kraft card around the room looked stunning. 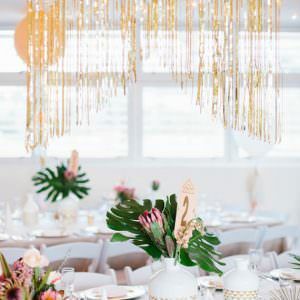 Once we had decided on our centrepieces being birdcages with tealights covered in clear and pearl beads, we knew that flowers were not that important to us. But then there is the obvious tradition behind having flowers so it became my mission to hand make our brooch & hydrangea bouquets and boutonnieres. The food was simply amazing at Holdsworth House Hotel as expected from award winning chefs. We had a four course meal of Ham Hock Terrine with Piccalilli, Leek & Potato Soup, Roast Beef and Sticky Toffee pudding for dessert. The cake was a three tier naked cake. Three tiers of sponge, cream and jammy goodness surrounded by lots of red berries and was made by a local cake artist, Lynn of The Wee Bakery. The burlap cake bunting was handmade me to match the bunting on the top table. 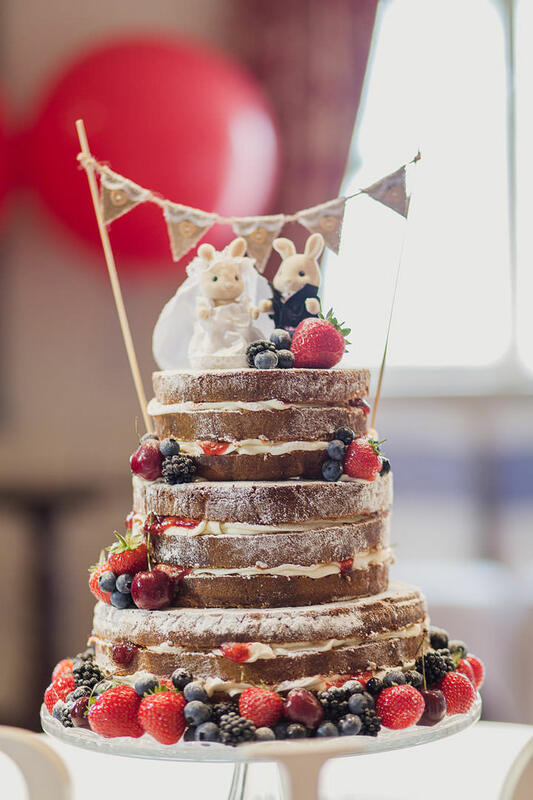 The cake topper of the Sylvanian Families bride & groom was a gift from my bridesmaid Katie and reflects back to my childhood obsession with them. 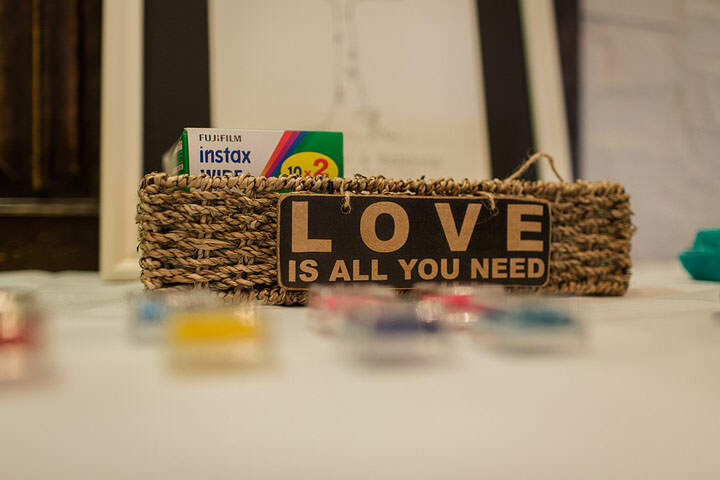 Throughout the wedding breakfast we had our Toastmaster, Mike Smith, offering our guests humorous words of wedding wisdom and then in between courses we had our Polaroid photo guestbook circulating each table. 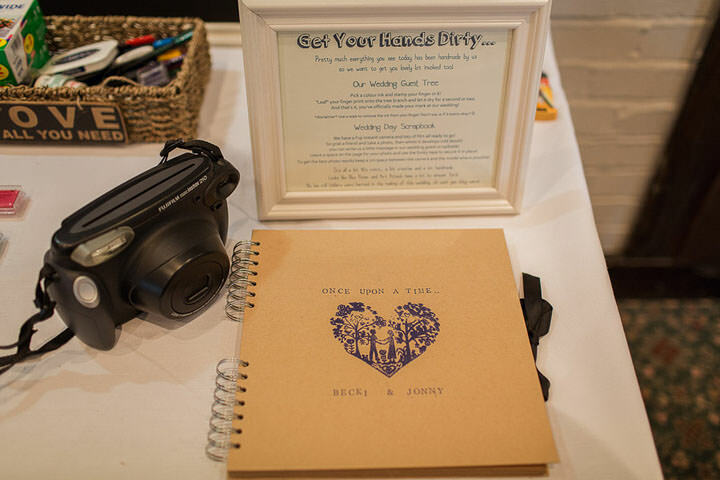 Each of our seven tables took instant photos of each other in groups and then using a tray full of crafty bits and pieces started to create our guestbook scrapbook (kraft scrapbook from Paperchase). This is something our guests loved getting involved in and the book is something we will treasure forever. 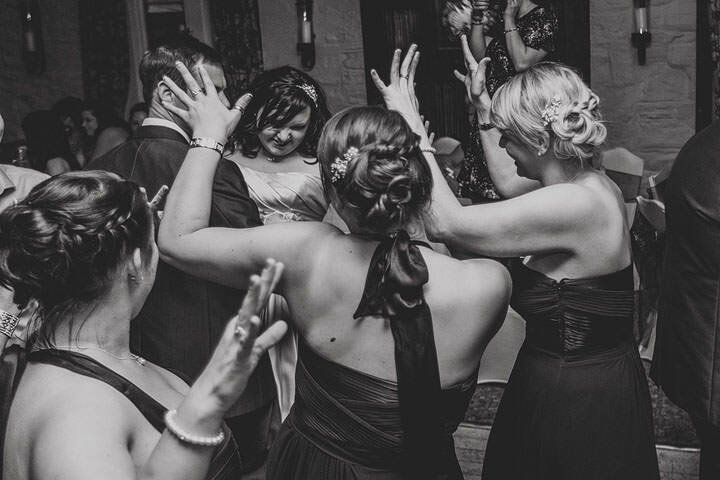 The entertainment in the evening was a DJ who was provided to us by the hotel and I will never forget dancing with my bridesmaids to the 90’s megamix!! Our invitations were the first of many of my diy’s for the wedding and were handmade using kraft pocketfolds, a Noolibird heart stamp and some hard graft! 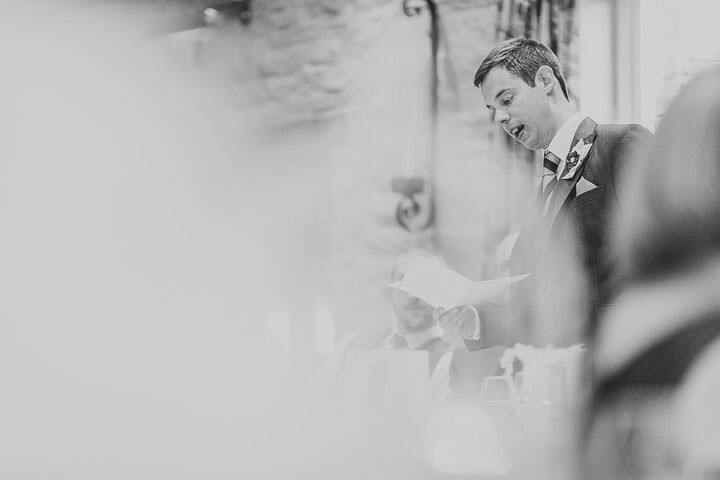 • Wedding Day Programmes – designed and printed by Jonny using InDesign and various funky fonts. Placed on each chair for the ceremony which provided details of who the bridal party were and what we had planned for the day. • Brooch & hydrangea bouquets for myself and the bridesmaids. This was a rather long diy project which included me tea staining the flowers! Yes I know completely insane, but I am so pleased with how they turned out. 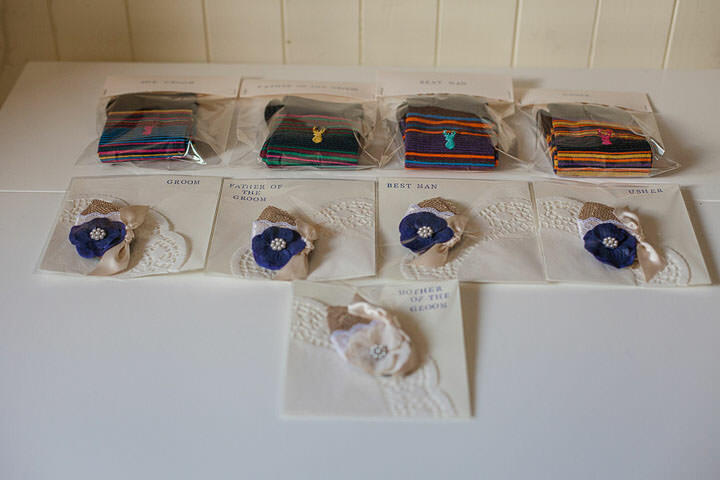 • Brooch & hydrangea buttonholes and made little presentation pouches for them. 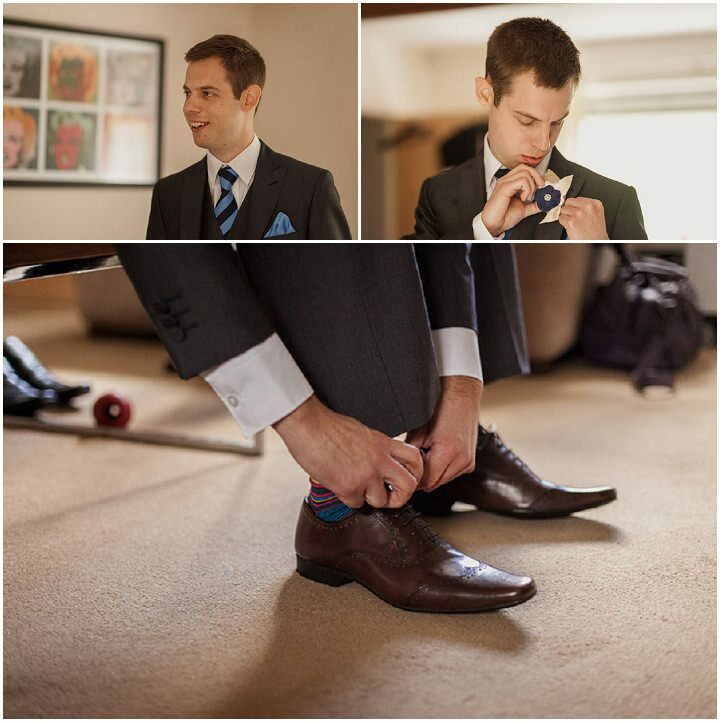 • Presentation bags to hold the groomsmen’s socks with a card topper saying “sock it to them” and “No Cold Feet Allowed” for the groom! 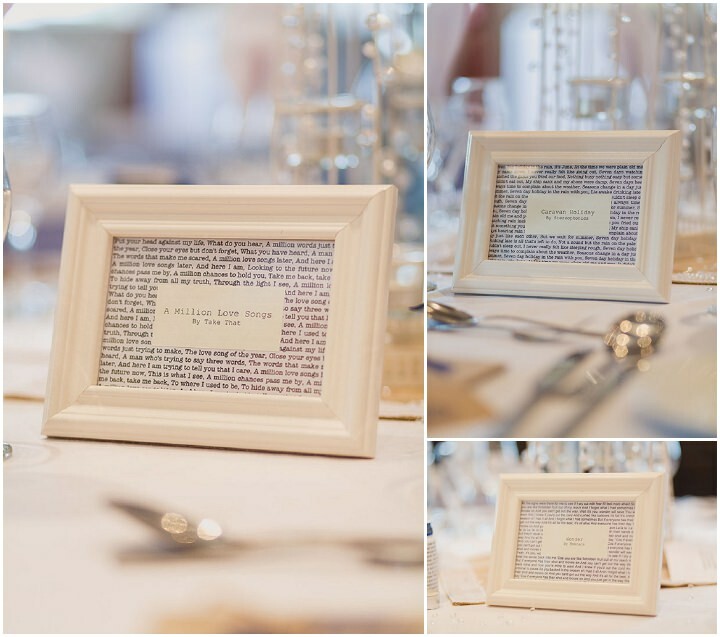 • Table names which were song titles, mounted onto the printed lyrics of each song and framed. 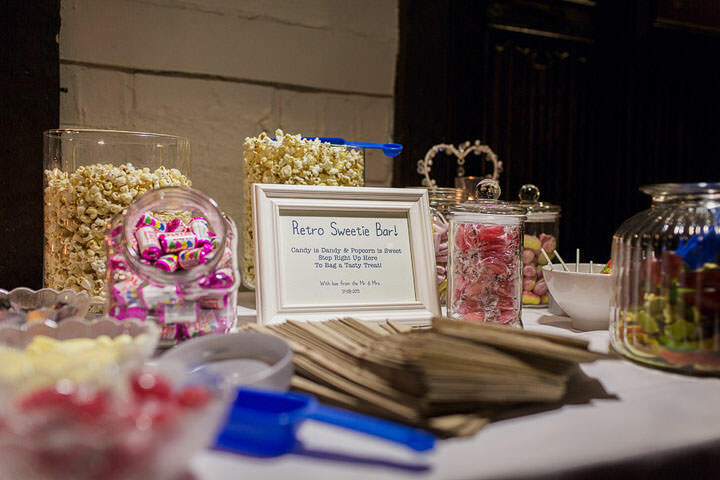 • Blue and White stripy straws from Pearl & Earl and I handmade some straw flags with our names and wedding date on the front and then phrases like “Cheers!” and “He asked, she said yes” on the back. 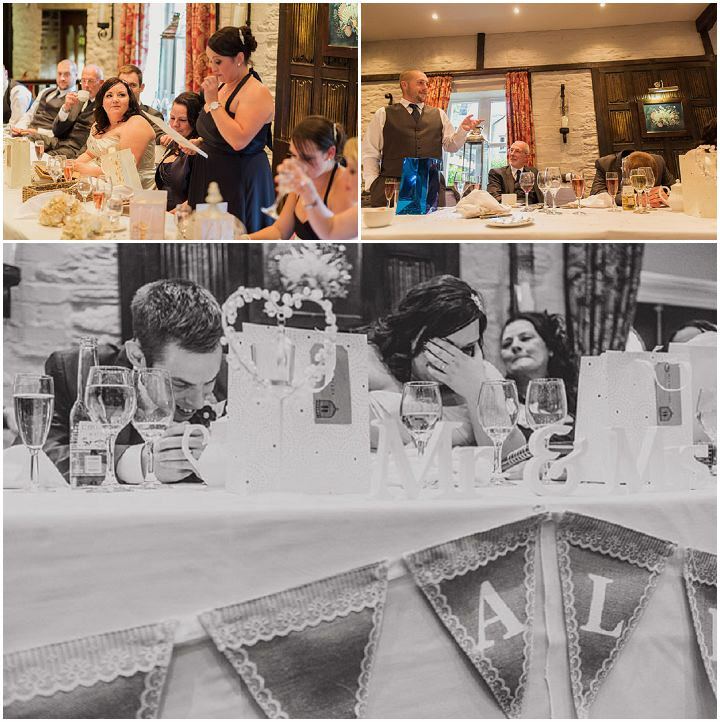 • Burlap and lace bunting for the top table – burlap cut into triangles, ivory painted stencilled letters onto each triangle to say “love is all you need” and edged with lace ribbon. • Mini burlap bunting with wood heart buttons as cake bunting. 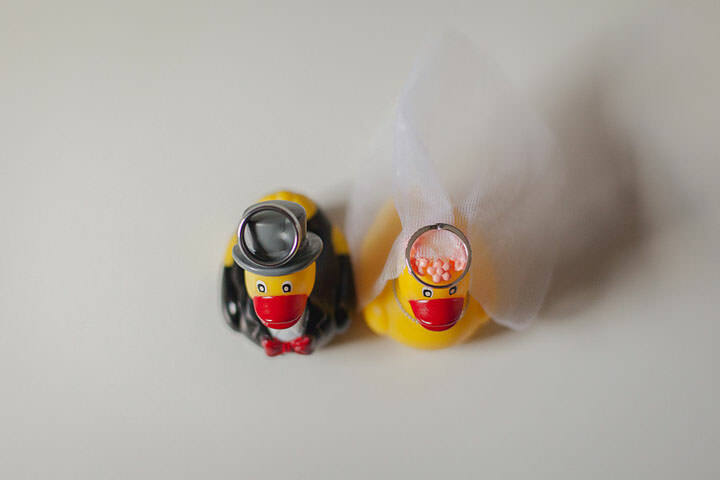 • CD wedding favours. Hand stamped the CD pockets with a tree and fingerprint stamped the leaves. Printed an inner card which held info about the playlist from the year 2001 which is the year we met. Printed CD labels and then wrapped them with brown string and tied the place name luggage tag on the front which was also hand stamped. 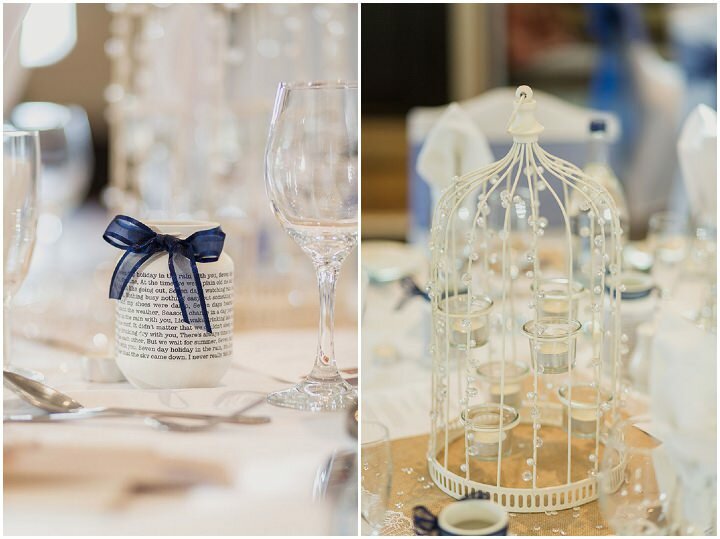 • I bought a birdcage memo board for our table plan but decided it needed to match the birdcage centre pieces so I wrapped some clear and pearl beaded fairylights around it. Then printed the guest names onto luggage tags and pegged them to it. • Hand made from scratch button badges using a badge making machine. 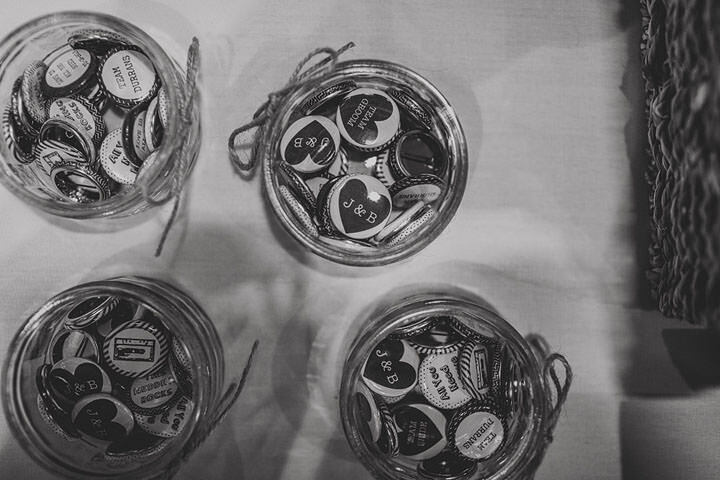 Printed out sheets of words, phrases and our initials onto paper and then used the badge maker to turn them into badges which were placed in glass dishes for our guests to take home. 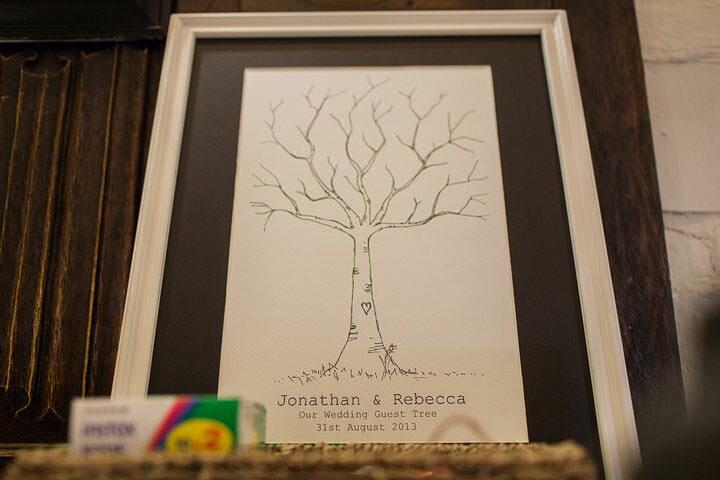 • We had a fingerprint tree printed which was mounted and framed (without the glass) for our guests to use the multi coloured ink pads and write their names on it. This has turned out so well and we are going to have it professionally framed before we hang it up in our home. • We also had a time capsule jar. 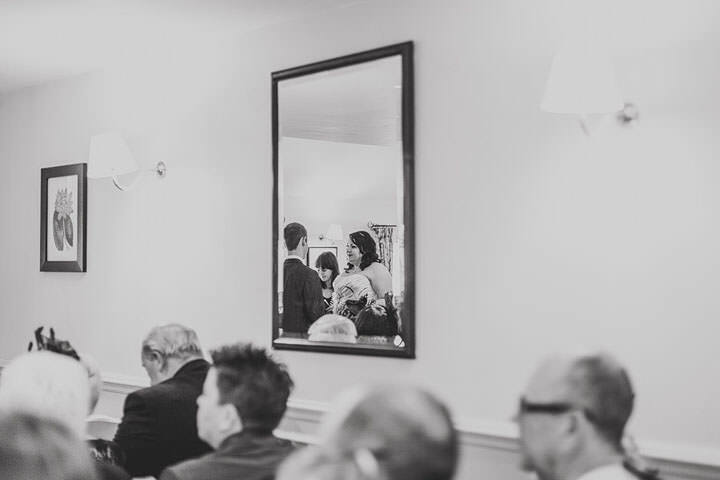 The framed instructions said “One Year From Now” which asked our guests to pick up a heart shaped card, write us a note, prediction or advice for the future and place it in the jar. We will then open the jar on our 1st Anniversary. 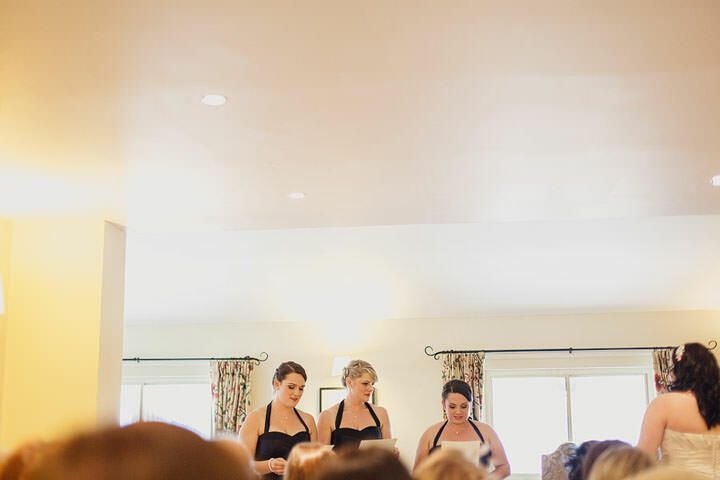 • I printed and framed a friendship poem for my bridesmaids as part of their thank you presents. 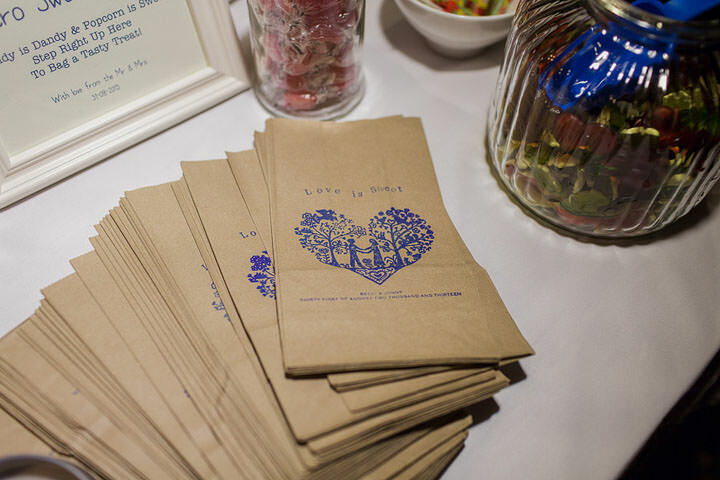 • I also made little goodie bags for the kids as their favours. So each bag had a little Lego or Disney fairy toy, sweeties, crayons and I printed out some Disney activity pages and rolled them up into the bag. 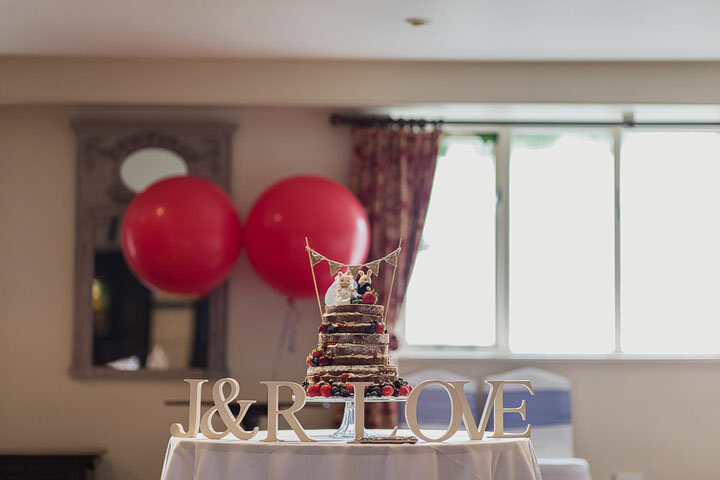 • The wooden letters on the cake table that spelled out LOVE and our initials we bought from a seller on ebay super cheap as they were unfinished wood. So we used the skills of my father in law to spray paint them cream for us. Now after the wedding I am using the initials to create some wall art for our bedroom by framing some burlap in a cream frame, removing the glass and gluing the letters to it in the middle to hang them above the bed. There were so many special moments throughout the day, but the highlights for me personally have to be our first look, the balloon release and our speeches. I wouldn’t say this was a surprise as such because we knew were in good hands before the big day, but I suppose we hadn’t really fully appreciated the work that our Toastmaster does. 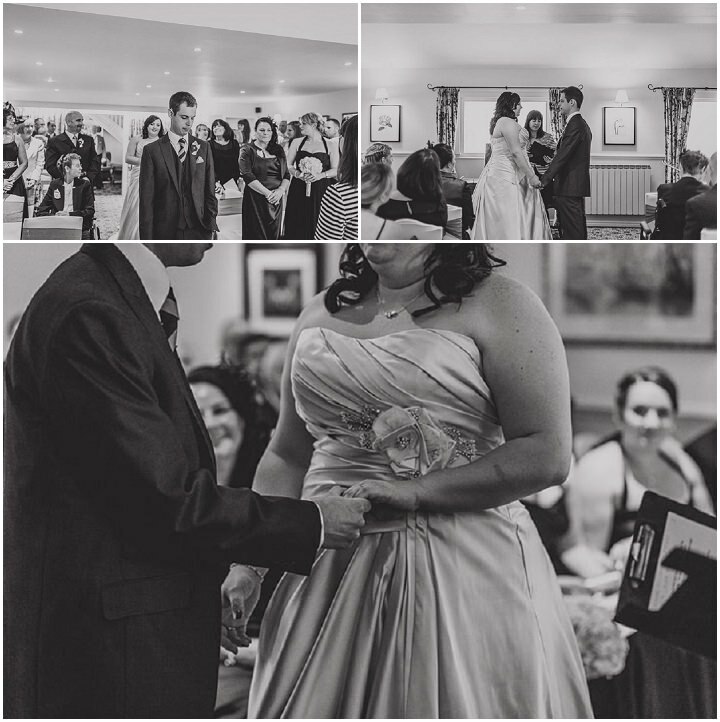 Having a toastmaster is something I suppose you would consider to be very traditional and initially we thought we were going for anything but traditional for our day but we are so glad Mike offered his services to us. He was literally two steps ahead of the game for everything and was there to make sure I was still able to walk down the aisle on my own, making sure we were where we needed to be for the photos and the cake cutting etc and provided assistance and entertainment to our all guests. We have had a lot of wonderful comments from our guests and would like to take this further opportunity to thank him for everything he did for us. 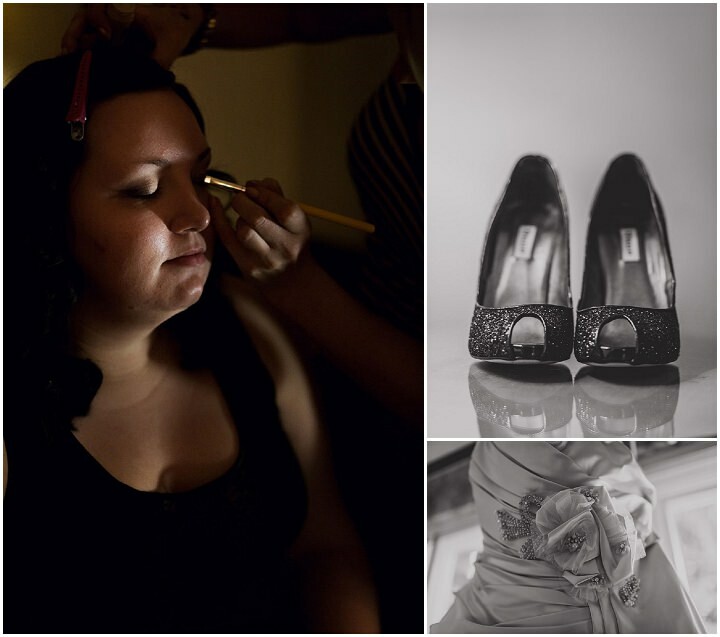 • Plan for an amazing photographer because what they do is absolutely priceless! 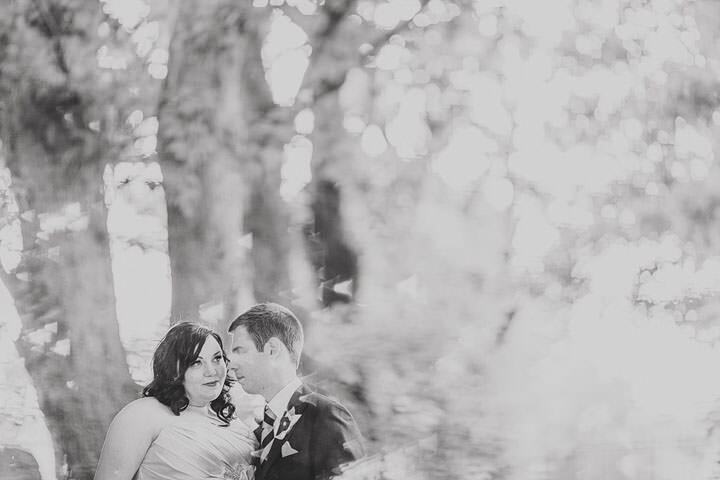 Paul & Kelly inspired us throughout the months leading up to the wedding and they still inspire us now. 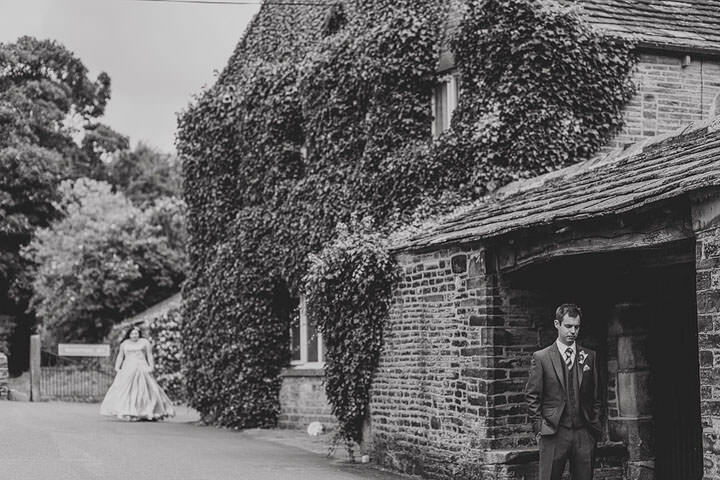 We are immensely happy with our love shoot and wedding photos that we will have to look back on forever and cannot thank them enough for everything they did on the day! 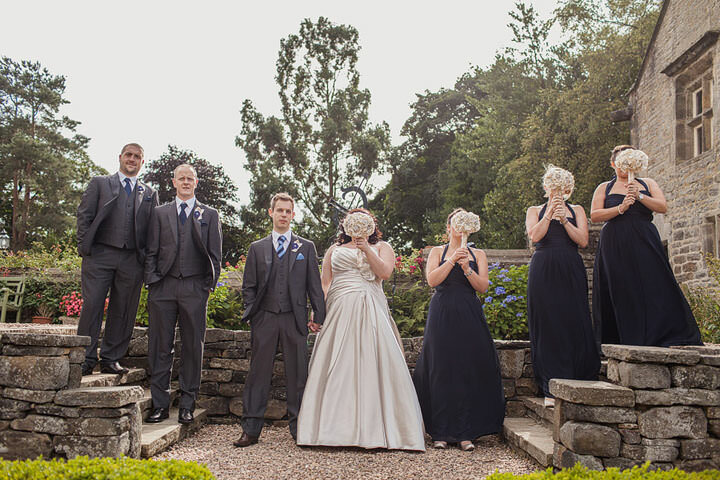 • Plan for amazing bridesmaids and groomsmen because what they do for nearly 2 years of wedding planning is also something you cannot buy. They not only help to shape the big day with you, but they create so many memories for you throughout the whole journey. 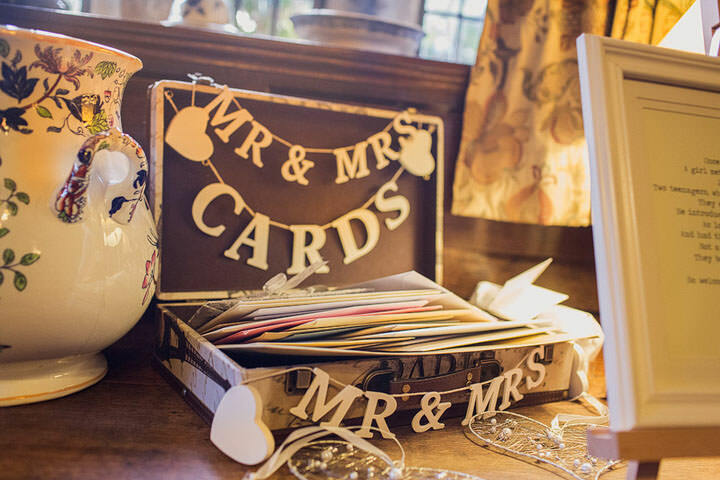 • Plan for amazing keepsakes like guestbooks, fingerprint trees and instant photos that you can dig out in years to come to reflect back on the perfect day. 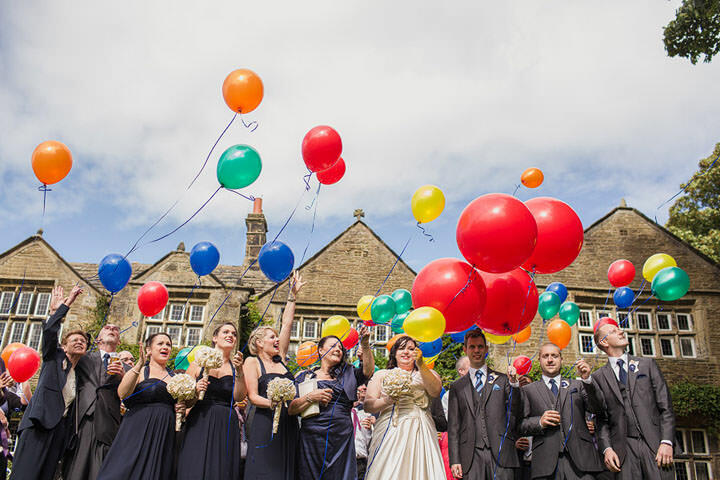 • Plan for special moments which make all your guests smile and laugh. Those are the ones that they will then recall to you in future as key moments they remember from your day. Nicely done kids. 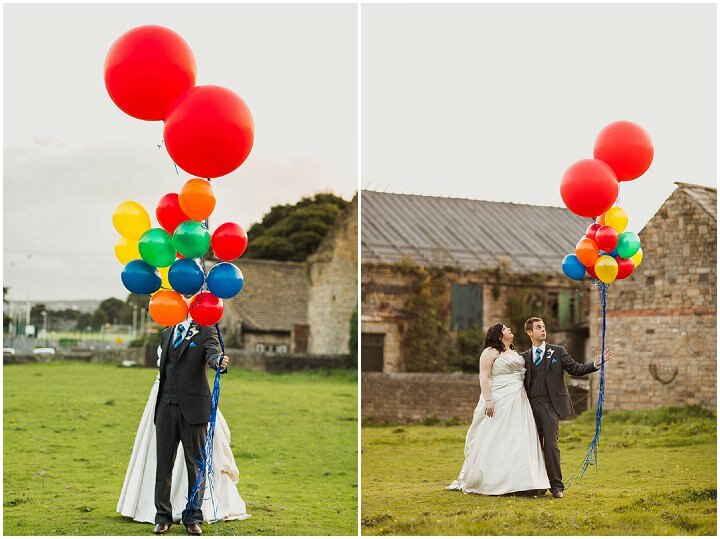 Love the balloons. 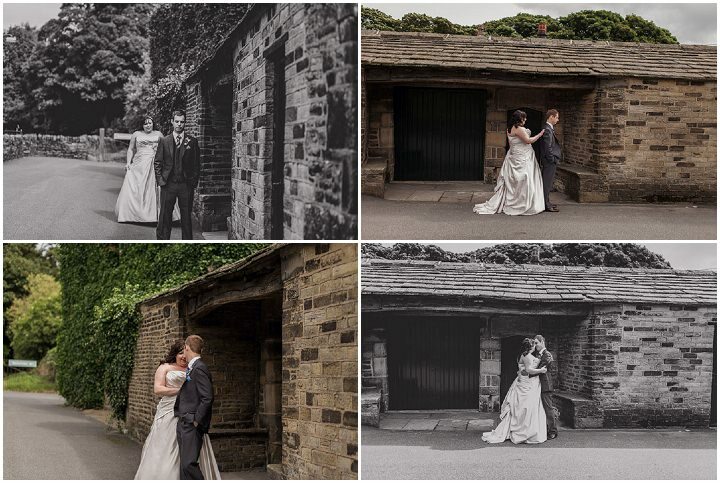 What an awesome wedding and great photography!! I still can’t get over how cute the wedding cake is! Beautiful wedding pics. 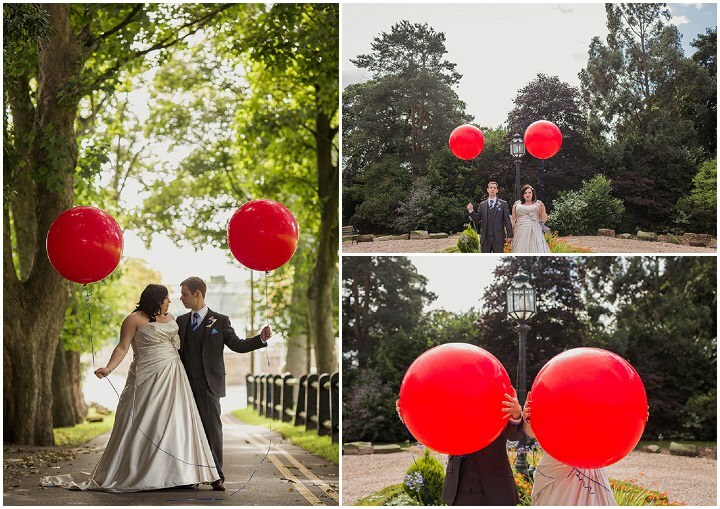 Love love love the balloons! 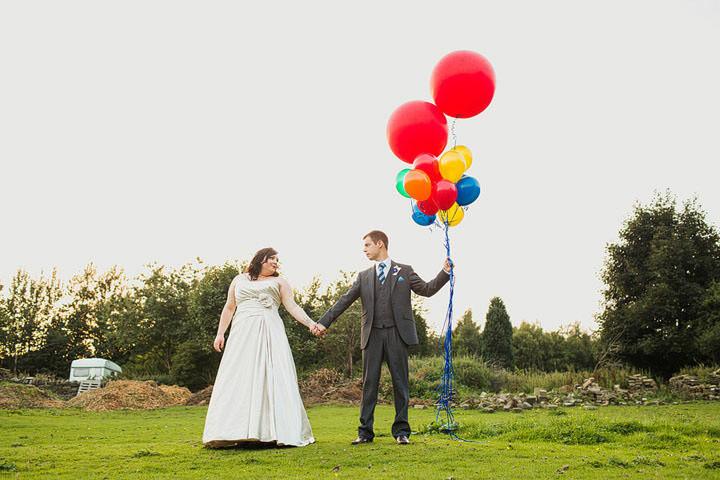 Epic balloon colours! Awesome wedding this! Only just thought to come back and look at the lovely comments from everyone, thank you so much!! 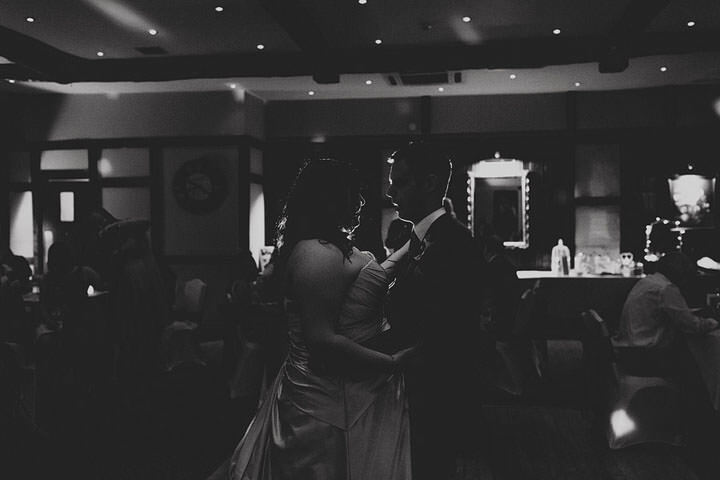 I am so happy that we got to share our wedding day on this blog and that people like what we did with it all. It was flaming hard work at times but i wouldnt change it for the world.